How Did We Get Into This Mess? : Frozen vs Little Mermaid: Two Anthems, Two Generations. I want vs I am. Frozen vs Little Mermaid: Two Anthems, Two Generations. I want vs I am. How is a daddy supposed to deal with Disney? My daughter, who is not quite 5, sings "Let it Go" at me approximately eight thousand times a day. What she lacks in intonation she more than makes up with the verve and gusto with which she goes after the song, not to mention the slamming of the door, the stomping of the feet, and the high volume. I have vivid memories of a cousin of mine, who I shall not name, singing "Part of your World" with equal gusto in the early 90s. I can remember her singing, "Bet'cha on land! They understand! Maybe they don't reprimand their daughters," in front of her father. Oh, the pathos and power of it all. The placement of these songs in the narrative structure of the movie differs. They both involve transformation, but Ariel's renders her mute (so the lobster gets to do the good singing) capable of only, as Ursula the sea witch says, "body language." Mermaid parents - teach your daughters to write and use sign language, ok! It's followed by the fairly awesome "Under the Sea," then reprised, before Daddy comes in and wrecks the place. "Let it Go," on the other hand, is after the big transformation.We already know what Elsa can do, but it's when she takes something she had perceived as horrible and turns it around. They are, though, the signature songs with a female solo vocalist, defining their characters, and influencing a generation of Disney-loving girls, including (sigh) my daughter. Disney isn't the worst, I guess, but princess culture is so powerful and generally so awful. Beauty and the Beast is basically a story of violent partner abuse in which Belle excuses her abuse as he has "just a short temper." Merida (Brave) kind of rocked, but of course Disney immediately tried to shift her from unkempt archer badass to heavily made-up hour-glass figure ballgown wearer. Little Mermaid, for that matter, is about a girl with a crush so bad that she radically disfigures her body in order to get her man. But Frozen, well ... On the 47th viewing, this week, I'm beginning to think it's not so bad. Maybe Stockholm syndrome (which likely doesn't actually exist) is to blame, but let's look at these songs. "Part of Your World" (click for the YouTube) finds Ariel in her cave of "land stuff." She sings about her belongings - "Wouldn't you say I'm the girl, the girl who has everything?" Then she says no, "I want more," it's not enough! The animation has her sighing, swooning, eyes lifting towards the surface. She wants to go somewhere else. She asks, "When's it my turn?" This is a song about I WANT. Elsa, on the other hand, hasn't been a pampered princess below the sea, whining about her lack of the hot boy. She's been locked away, orphaned, abused, repressing her emotions. She's been given bad advice - conceal, don't feel, hide your identity. It's not necessarily her parents' fault that she was given the bad advice, but it's still bad (especially because it turns out that feeling MORE - feeling love - is the secret to controlling her powers). In many ways, both of these girls are abuse victims and there's a painful dysfunctional sadness to much of the first third of the movie. Still a little teenage rebellion. Not that there's anything wrong with that. Punk will never die! Later, she notes, "That perfect girl is gone." She's finding her powers, and sure, it all goes terribly awry, plunging the land in endless winter, nearly kills her sister and hands over her kingdom to a manipulating evil prince - but at least she's embracing her power and her identity, and damn the consequences. Although the consequences catch her later. And it's fine if she wants to do it all in a super sparkly dress. This song is "I am," not "I want." I find it reassuring that this song about embracing one's true self, no matter how weird or seemingly monstrous, is the big hit from Frozen. My daughter wants to be Elsa, not Anna. Anna has songs before "Let it Go," and in another movie the charming, "Love is an open door" might have carried, or the classic "I want" song, "For the first time in forever" might have picked up the attention. But that's not the story of this movie. It helps that Anna's sweet love duet turns out to be with the Machiavellian would-be-murderer Hans. Hard to romanticize that relationship. The YouTube video above has been viewed 176 million times. In many ways, Anna represents the new princess model better than Elsa. She's plucky, determined, gets seriously abused in body and mind, but recovers through the power of love (from her sister) and the actions of a cute but imperfect boy (rather than Prince not-so-Charming). Sometimes when my daughter comes home and tells me about playing Frozen during recess, she say that she was Anna. 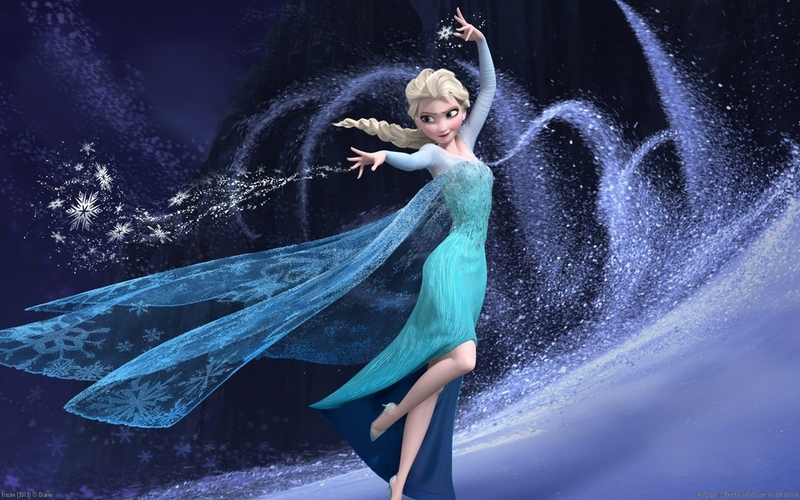 She lifts her hand in the air so that she can freeze Hans' sword. Not usually, though. Usually, she's been Elsa, letting it go, using her ice powers for awesomeness. I like the idea of a generation of girls punching their fist in the air and shouting, "The perfect girl is gone!" over rolling their eyes and sighing, "Maybe they don't reprimand their daughters" or "I want more." And if the message of Frozen is more complex, and perhaps more troubling, than the song - the song is living a life of its own divorced from context, much as "Part of Your World" did. On the whole, I can accept this as an almost five-year-old's power anthem. I'm sure Disney will find a way to screw it up, but for now ... Let it go! Let it GOOOOOO. Here's my daughter just hanging out, singing, and making it most of the way through the song before she runs out of steam. It may not be polished or perfect, but it's real.